Michel Legrand’s ‘What are you doing the rest of your life’ is a delightful jazz ballad written in the key of C major. This is a challenging tune to learn and contains some difficult to navigate chord changes – particularly in the bridge. 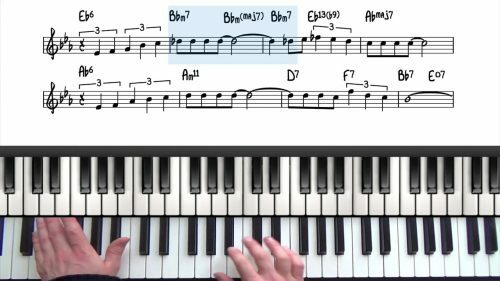 In this lesson we start by playing the melody with left hand voicings to get a good idea of the movement of the chords and the melody. We then add some bigger sounding voicings and more interesting root movements to add interest and dynamics to the arrangement. We also cover some other interesting voicings options such as sus chords resolving to altered dominant chords . This delays the sense of resolution creates movement and interest when the harmony and melody is stationary. The Bill Evans recordings of this tune are definitely worth checking out. He plays the tune with such depth and maturity and there is a lot of emotion in his arrangement.